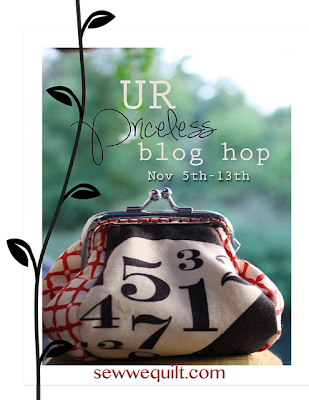 Welcome to the second day of the U R Priceless Blog Hop. this lovely pattern I knew I wanted to make it. I enjoy making framed purses and this pattern is just too cute. I made four as gifts for Sewing Summit friends. This one now lives with Katy in England. Isn't this airport code fabric cute? I ordered it from Spoonflower. across the southwestern United States. And finally, the last one was made for Danny. She likes guitars and music and this was just the right fabric for her. This photo shows just how small these little purses are. but small enough to not weigh down your purse. I made one change to the pattern. that Madame Samm recommends in her pattern. Be sure to check out the other posts in the blog hop. Here's a list of who is playing along today. by clicking on the link in my sidebar. Di, your coin purses are FABULOUS! I know your friends must love them - each one is so thoughtfully made. Love your fabric choices! Lovely little purses and how nice they were all gifts. Your purses are wonderful - I like the fabrics that you've used, your friends must be thrilled with their gifts. I love how you choice fabric perfect for each of the folks you gifted! That makes the purses really special. Yours turned out lovely. Thanks for showing us here today. These are great, well done. Was it tricky gluing all that into the frame? I've made glue-in ones before but with less surface area to fit in, when I made the sew in ones I thought I might get messy trying to glue them! Those are all so cute; especially the one with the smiling cat! Such cute fabric choices! And what a wonderful friend you are to share. Cute little purses!! Great Job!! Oh those purses are so cute, and so fitting for each recipient. You are the queen of purses. They are all so cute, what a great job! I love the fabrics you chose for your beautiful little purses! Great job! Oh that cat one is just divine! Gorgeous fabric! Love your purses! Now I'm on a search for the red/white fabric with all the US cities listed! What fun! Your friends are such lucky ladies! Thanks for sharing! Love your guitars :) So awesome! Would you recommend sew in or glue in frames for a beginner?? I didn't notice that it was a glue in frame. I was too busy noticing the fantastic fabrics you used. They are awesome!! Great fabric choices! Very cute! Yours are super wonderful. Thank you for sharing. Hi!!! Love all of them!!!! That little cat is so adorable!!! Thanks for the fun!!! Just darling! And just as sweet with the glue in frames. You sure excelled at matching fabrics with recipients! You've made your friends very happy with these sweet purses. What fabulous fabric choices! You did a great job. How was the gluing? I wondered if I would end up with a big gluey mess if I tried a glued in frame? I love the fabric choices. Great job! these are SO cute but my goodness that kitty is my favorite! Such sweet little purses--love them all! What sweet gifts. They are all so cute. Love them all, but the kitty just steals my heart! Love your fabric choices! Nice job! Your pictures are lovely - very nice. And the purses are fantastic. The airport code fabric is cute & the town name fabric looks great! Well done. Great job! I like your fabric choices! Love the fabrics you used! Thank you for sharing. Very pretty, they make such lovely gifts don't they? Cute, I love your sweet purses! What adorable gifts for your friends...love all the fabrics you chose...TFS!! great idea to use fabrics that go with the person's likes. thanks for sharing. So adorable Di! You do such a great job! I just bought my pattern so that I can make some as well. Cute fabric choices. Love Hometown and the luggage tags, but the grin on the cat is priceless. I have heard so much about the glue in frams, I will have to try one. Your are so cute and you already giving them away, how wonderful. Love the ones you've already made and given away. Where is your own?! They are all awesome and so well traveled! These are priceless. You are a good friend to pick fabrics so closely related to your friends. Such cute purses. They must make everyone happy who gets to see them. Oh I love the guitar one and the kitty one the best! I LOVE the cat purse, so cute!!!! They are all so CUTE! I love them all. Meow! I love it. Travel is also a huge part of my life and I think your purses are so darn cute. Thanks for sharing. Well done! !I love hopping from blog to blog and seeing everyone's creativity. Great job!!! The kitty and guitar purses are my favorite. Thanks. Such beautiful and unique fabrics! They are so cute! You have great fabrics that you used for each friend. I agree, coins can be heavy but this is the perfect size. thanks for sharing. What cute little coin purses and I like the idea of the glue in frame. OH, the fabric choices really do make the purse, don't they? I love the little camo kitty! Your recipients are going to squeal with delight! These are so lovely! You are so talented! Great little gift for your friends. Personalizing them by fabric choice was a nice touch. Thanks for sharing. They're all so lovely! You're a very good friend, indeed! I ♥ those clasps on little purses!!! Such pretty fabric, too. Diane, beautiful coin purses, love your fabric choices...what perfect little gifts. Thanks for sharing in the blog hop!! All your purses are adorable. I love it that you chose such special fabric for each and every gifted bag. The glue in frames worked really well; I've heard that the process can be rather messy. Do you have any tips for the glue-in variety? These are really fun purses. I just love your fabric choices! Thanks for sharing yoru creations today! Really adorable. Thank you for sharing with us. They're too cute Di! Thanks for sharing with us all. Your coin purses are all wonderful! I like the special fabric choices you made for each friend. Great job! I've seen the glue-in-frame tutorials, and wondered if this pattern would work! Lovely, They are just too cute! I might have to try thr glue in frame myself too. Awesome coin purses that you have created! And how fun that they have already gone on travels or will be heading out on future adventures!! These are such cute purses!